Teams learn they’ll be in or out of the playoffs, others manage injuries with an eye toward January or next season, while some teams battle for playoff positions. 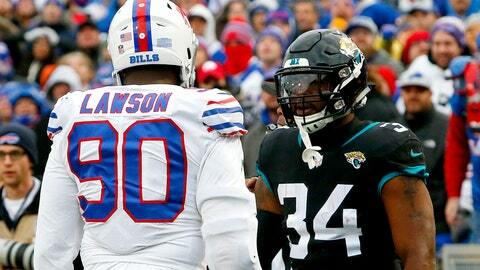 Leonard Fournette’s suspension opens up value in the Jacksonville Jaguars backfield for Week 13 with T.J. Yeldon and Carlos Hyde both becoming intriguing options. Both running backs cost less than $5,000 on FanDuel, while Yeldon is $4,400 and Hyde is just $3,300 on DraftKings. The Jaguars have a 21-point implied team total this week and both backs could have value. Yeldon is a target on DraftKings with its point-per-reception format and should maintain his third down role at minimum with upside of receiving 50 percent of the snaps. Yeldon has a floor of four to six targets, with upside for more in a game where the Jaguars will start QB Cody Kessler and are projected to be playing from behind. At $3,300 Hyde is still in consideration on DraftKings and could be the better play on FanDuel with the more TD-heavy scoring settings. In Week 8, his first game with Jacksonville, Hyde stepped in for Fournette and received the majority of the team’s carries and the first crack as the goal-line back. Now more familiar with the playbook, Hyde could see 15 to 20 carries and should again be featured at the goal. At near minimum price on both sites Hyde doesn’t need to do much to pay off his cheap price tag. While the Buccaneers are all but eliminated from contention, they will look to spoil things for divisional foe Carolina. The Tampa Bay QB position, whether occupied by Ryan Fitzpatrick or Jameis Winston, is a QB1 in seasonal leagues and has produced top 5 numbers at the position. Winston will lead the Bucs offense and there could be value at the wide receiver position. DeSean Jackson is seeking a second opinion on his thumb and was ineffective in Week 12, playing less than 50 percent of snaps and catching just three of his eight targets. If Jackson misses time, it will lead to an elevated snap count and target share for both Chris Godwin and Adam Humphries. Both receivers have produced 20-plus point fantasy outputs and can be considered as secondary options for lineups pairing up Winston with top target Mike Evans. Godwin and Humphries can also be considered as contrarian elements of Carolina Panthers stacks that feature Cam Newton and Christian McCaffrey, knowing that Carolina should be able to put up points with a projected team total above 29. The Buccaneers will be forced to throw and one of Godwin or Humphries is likely to pay off their low daily price tag. Users building multiple DFS lineups would be wise to exploit this injury situation. Indianapolis tight end Jack Doyle is out for the season and Eric Ebron will see an increased target share in addition to his high red zone usage. Running back Rex Burkhead returns for New England which could impact Sony Michel and James White. Melvin Gordon’s injury will create value from Austin Ekeler and Justin Jackson in the Chargers offense.